Decide if you need to create a 1099. 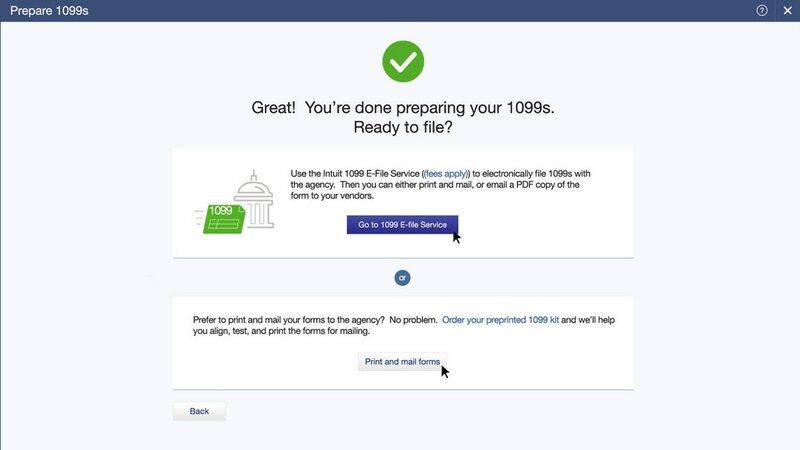 If you have questions about whether you need to send a 1099, this guide can help. When in doubt, it’s always better to set up a worker with a 1099 and not need it than the other way around. As always, your accountant is your best resource when you’re in doubt. Set up the vendor for tracking. You can set up tracking the first time you pay your contractor. As you add the contractor as a vendor, check Track Payments for 1099 and enter their Tax ID. For most independent contractors, this is probably their social security number. If you don’t do this at first, you can always go back and do it later. On the check you write your vendor, choose an expense account. When you enter a check, be sure to select an Expense account that makes sense to you to help you track the contractor expense. Be sure to make a note of which Expense account you use because you’ll need to know this later. QuickBooks tracks this check and adds it to the contractor’s when you create the form. Use a separate line for anything that shouldn’t appear on the 1099. For example you could pay a vendor for work she did and equipment you rented from her. The payment for work should go on a 1099, but the equipment rental should not. To keep things separate, use a separate line for each expense and assign different accounts to each. If you pay the vendor with a credit or debit card, you don’t need to send them a 1099. QuickBooks tracks credit cards automatically so there’s nothing you need to do. If you pay a vendor with a Debit card, be sure to enter DEBIT as the Reference number so QuickBooks knows not to track this payment for a 1099. 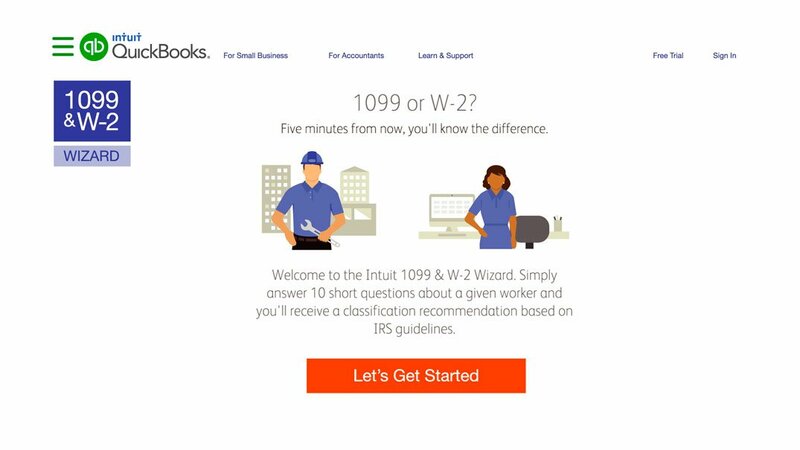 At the end of the year, it’s time to prepare 1099s for your contractors. Click Vendors then Prepare 1099s at the top of the screen. Click “Let’s get started” to begin. First, review your company details and make any changes. This information should include your company’s legal address that you use when you file your taxes. Assign the expense account you used to pay the contractor to an appropriate IRS-defined box. Most likely, you’ll use the Non-Employee Compensation box. Select the account you used when you paid your 1099 worker. Remember when we told you to make a note of the account you used when creating the expense for this vendor in Step 3? This is the same account you’re assigning to an IRS box here. 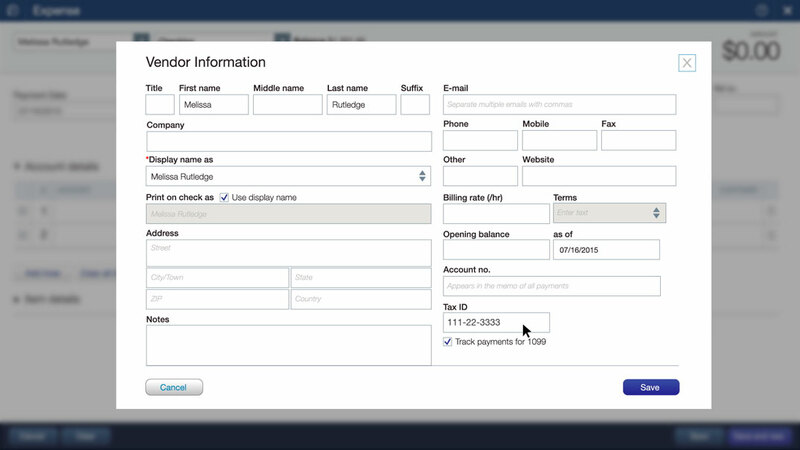 Select any accounts you used when creating Expenses for vendors you’re creating a 1099 for. Be sure you don’t include any asset accounts. If you have any questions about assigning these accounts, check with your accountant. Look over your list of vendors and make any changes you need to. If you don’t see vendors listed who should get a 1099, click “Select vendors” and add them. Review the information that will go on the 1099. You can change the filter to a different year and other settings if you need to. Choose how you want to file the with the IRS. You can use Intuit’s e-file option or print the information on pre-printed form and mail it. Note: If you choose to print the 1099s, you’ll need to order the forms first.